xServers Review 2019: Is xServers a Good Hosting? xServers is the go-to hosting solutions provider for individuals and businesses in Romania. For a company that knows a thing or two about web hosting, xServers has a lot you can take advantage of and many features you can use when you subscribe. 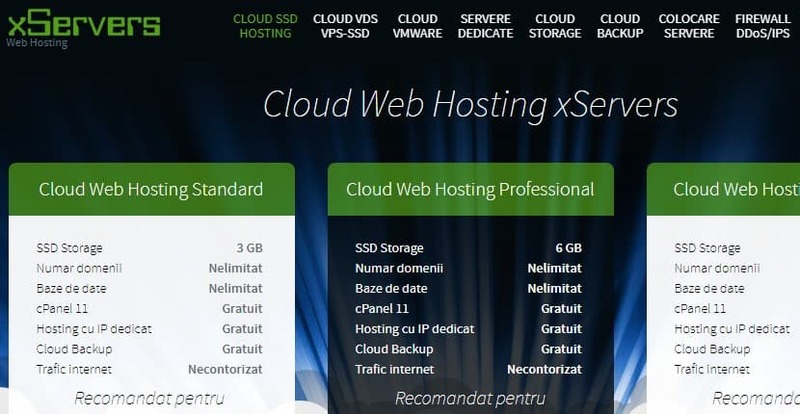 For over a decade, xServers has been in the web hosting business providing hosting solutions to individuals and enterprises in Romania and beyond. Over the years, the company has sought to maintain the highest service standards in the industry and in the process has become one of the most preferred hosting services vendors in Romania. Their services are primarily for Romanians, thus the website is only available in Romanian. All the same, the company is open to providing website hosting even for clients beyond the Romanian borders. Enterprise-class SSD storage – xServers is one of the few hosting vendors in Romania that use enterprise-grade Raid SSD drive storage. With a read/write speed of 500Mbps, xServers is able to give an assurance to their clients of a high SEO score for their websites. 985% uptime guarantee – xServers assures its clientele of a 99.9% uptime for all its hosting solutions, except its VMware Cluster service which has a slightly higher uptime guarantee of 99.985%. Protection against Malware, DDoS, Injection, etc. – xServers uses state-of-the-art security protocols to protect the websites it hosts. Its expert anti-flood protection system is able to remove malicious packages when a DDoS attack occurs. Its HP Tipping Point IPS protection system is effective in protecting websites against Cross Site Scripting, SQL Injection, and other such intrusions. Advanced redundancy protocols – xServers data center is located in Bucharest, Calea Floreasca 169. This data center has numerous redundancy interconnections provided by some of the main internet service providers across Romania and beyond. The direct international redundancy links have a capacity of 30Gbps while the Romania interconnections have a capacity of 50Gbps. This makes it possible for xServers to guarantee dependable internet access to all their customers anywhere in Romania. Compared to other vendors in Romania, the xServers web hosting platform is not the simplest solution for a beginner. However, for someone who knows something about web hosting, there is a lot to take advantage of and many features to use when you subscribe to this company’s solutions. From the cheapest plan to the most expensive, all xServers hosting plans include unlimited traffic, free cloud backup, and free firewall hardware. Compared with other hosting solutions in Romania, xServers prices are quite affordable. xServers does not provide a free version for of any of its hosting packages, nor does it include a trial version. xServers is proud to offer high-quality 24/7 support services to all their customers. For most organizations, the free xServers standard maintenance package would suffice. But for larger enterprises that need dedicated support, xServers has a number of paid support plans you can choose from. Upgrading and downgrading a subscription is also quite easy. xServers has made available a phone number that its customers can use to contact its technical support team. xServers customers can also contact the technical support team via email. When I contacted this vendor’s support team via email, they responded quickly and gave me a somewhat detailed explanation of how the issues I had raised could be solved. onClick="trackClickout('event', 'clickout', 'Vendor Page - Visit User Reviews', 'xServers', this, true);"
Daca nu sunteti profesionisti sau fluenti in wordpress / php sunteti fututi. Le-am contactat cu o problema la unul dintre siteurile noastre si in loc de macar a incearca sa ma ajute mi-au alungat sa fac nu stiu ce fel de verificari inainte de a ridica un tichet la ei. La urma mi-au zis: "Wordpress pune la dispoziție o metoda de debug, recomandam sa o porniți și sa verificați erorile primite." ....deci de ce ne-ai scris, rezolva-ti problema! xServers has created hosting solutions that merge affordability with innovative features making them the perfect hosting vendor for someone who wants high quality hosting solutions at an affordable price. Wondering how xServers stacks up against other Web Hosting companies? Enter any other Web Hosting company and we will give you a side-by-side comparison.